How do I integrate GetResponse with Google Analytics? If you are currently using Google Analytics on your site, you now have the ability to enable Google Analytics tracking links automatically in your GetResponse email campaigns. If you do not have analytics in place or would like to use Google Analytics with your existing system, it is freely available to all site owners. If you already have analytics working on your website (and most of you do! 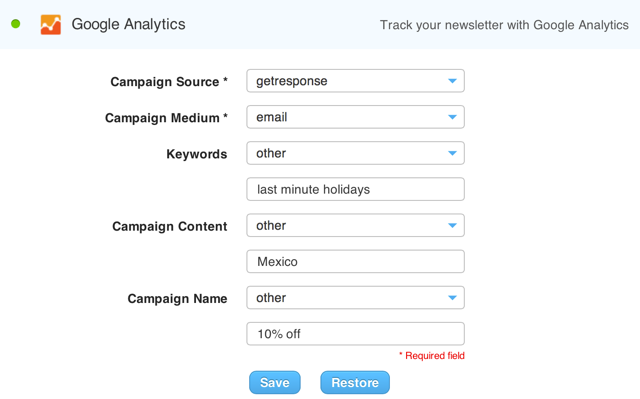 ), then linking your GetResponse email campaigns to current analytics account is very straightforward. All you need to do is click the ON/OFF button in the first stage of creating your message to activate or deactivate Google Analytics tracking in your newsletter. That’s it! From here you can track campaigns and newsletters in your Google Analytics account. The integration will automatically modify the links in your newsletter with all the UTM parameters needed for in-depth tracking. If you want your message to be tracked even more precisely, go to GetResponse Integrations tab and use Google Analytics form. Medium and source, taken together, provide specific information about where the user came from. These two fields require entered values to perform tracking correctly. Campaign name – e.g. sunny holiday. Note that with Google Analytics integration switched on, Source and Medium will be included in the newsletter links automatically. Source will be defined as getresponse and Medium will be defined as email. You can define other values according to your preferences. All newsletter links will be tagged as shown below. After you log in to your Google Analytics account, you can find your email campaign results by clicking Traffic Sources -> Sources -> Campaigns. A list of all the campaigns you have tagged for Google Analytics to track will be displayed. The campaign names that you see on the list are the campaign names used in your GetResponse account. When reviewing reports in your Web Analytics dashboard, you can easily segment traffic based on several characteristics and quickly find traffic figures originated by the newsletters you sent. First look for the Secondary Dimension drop-down box. You’ll see a long list of options to choose from, including Add Content. This corresponds to the subject lines of all the newsletters in your campaign (the ones where tracking was enabled) so you can track the source of the traffic, which email campaign it’s coming from, all the way down to which particular message is generating the traffic. If you want to see results of particular links in newsletters, select Secondary Dimension > Landing Page. -when using clicktracking and Google analytics at the same time the links can take your contacts to 404 page, please use only one option at a time. -build your links for GA integration using the link builder. Also, Google Analytics integration does not work with links which end with .net. -the server of your web site has to be able to process the parameters in the link, if it is not able to do it, the page will direct to 404 error. – make sure that the servers you link your URLs to have installed a Google Analytics script and also accept GET parameters.